The heart of Europe beats in step with the mingling of populations and musical sensitivities. That is hardly surprising on the part of a world in itself, the Alps, that fuses the fragrant melodies of the East with western instruments, the yodel of northern parts with the polyphonic vocals of southern climes, the twitter of birds with the steady beat of a forge. All in perfect harmony. A voyage. Modern masts inspired a Swiss musician to make his Alpenhorn shipshape for travel. Roger Zanetti transformed an instrument that is an integral part of Alpine folklore into a high-tech object, better suited to travelling far and wide, and yet still clearly an obvious member of the traditional Alpenhorn family. Perhaps the equivalent of what the Swatch is to the old cuckoo clock. A sonorous testimony to the Merveilles valley, the Boisage and Ferrage music, without any instrumental eloquence, was improvised by Philippe-Marcel Iung as the product of souvenirs, disparate texts on paper transparent like ice and feverish mixes. A score in the form of letters that arrived piecemeal in his mail box, week after week. Anything goes when it comes to putting people and days into motion between the Italian Alps and the Mediterranean. Brass bands, accordions, clarinets, harmonicas or bark whistles, music is a part of life and above all brings together people borders notwithstanding. From the old folklore tunes to jazz, it changes and adapts, ever vibrant and welcoming. For Berlioz, mountains, a place to isolate one’s self and meditate, are the ideal setting where music can blossom, far from the insipid lowlands where art must compromise and slowly suffocate. A voyage in an enchanted Alpine environment. 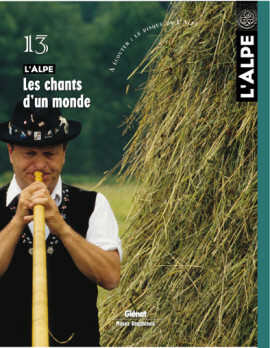 Originating in Alpine pastures, yodelling is a call to the grazing animals to come home, a means of communication over long distances and an archaic musical form. Often diverted from their original function, these inarticulate calls and modulations as ancient as the hills themselves have a very special spot in Alpine folklore. Maurice Baquet, cellist-mountaineer-humorist, Robert Doisneau, photographer, and Frédéric Lodéon, journalist-cellist. Quite the trio that adopted the Alps as their musical playground. The first recently celebrated his 90th birthday, the second stated that he has finally found in the first his « happiness professor » and the third pays a warm and friendly tribute to the two others. A mingling of viewpoints. For Olivier Messiaen, mountains are a primary fount of creation, both divine and musical. The havoc of the glaciers, the light on the summits and the singing of the birds are all sources of inspiration for his works. During his frequent stays in his retreat in the Dauphiné, he absorbs the many rhythms and colours. The fair lady is all atremble. Seduced by the singer and dancer who steps onto the bucolic stage at dawn and performs an intricate choreography to the rhythm of his raucous vocals. A naturalist attempts to reproduce the serenade of the tétras-lyre with a simple piece of wood. Ah, the miracle of love. That is the terrible image evoked by the Alpine Symphony by Richard Strauss. The mountains are simply a decor and a pretext for an orchestration that, though technically brilliant, it lacking in feeling and spirituality. A work in Technicolor, closer to a film soundtrack than the poetry of the summits. A sledgehammer slamming the Matterhorn, a red rose at the top of mount Everest, psychedelic mountains with wafting smoke, rock stars going all out in the middle of cliffs or camels at the foot of a climbing route. Rock’n’roll has certainly produced a highly original perspective in which mountains occasionally play a surprising role. Sheep bells are of course very functional, but they also play an aesthetic role. Whether clear or sombre, male or female in tone, they are above all the choice of the person who selects them with great attention and care. A means of recognition and the sign of success, they strike up the music of the Alpine pastures. This multiple reality grasps our attention because it has evolved, in transmission, into a self-magnifying form that makes us love it, a form that is born of the succession of images, their affinities and their contrasts, a form that is rhythm and may be likened to musical composition. In the beginning was the cow. And a love story between the big, soft-eyed beast, a photographer and a sociologist. They both courted her, the first to take her picture, the second by roaming museums and libraries. This great passion produced a book to be published this fall by Glénat. Highly subjective, whimsical, given to flights of fancy or solemnity, but never to clichés, this stroll through the bovine universe, illustrated with the photographs of Roberto Neumiller and a number of other, often unpublished, works of art, is joyfully original. An excerpt. Hot debate in Geneva concerning the project for a new ethnographic museum called the Esplanade des mondes. With a rich set of collections from the world over, including the Amoudruz Alpine collection, the museum has made clear its ambition to become an intercultural catalyst, a place where diversity and differences may express themselves. An attitude toward others that would seem to bother some. A plea for an ethnography open to all.